Before we get into the main topic, let’s see some types of Nendoroid stand that are commonly used. 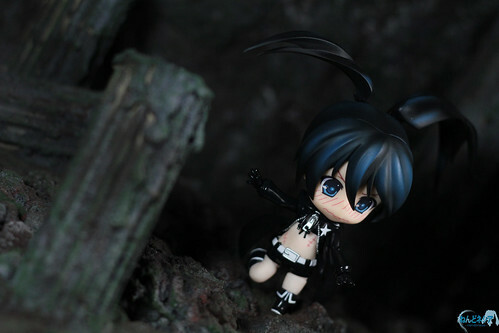 Back plug-in: This type of stand is usually found on newer Nendoroid releases – starting from Black Rock Shooter. Stick one end of the stand arm to the hole on either hair or back of your Nendoroid, and stick the other end to a hole in the base. Magnetic: A few recent Nendoroid come with this stand. 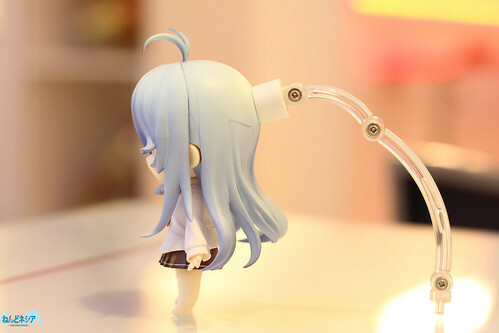 Simply put the magnetic end of the stand arm to the back of your Nendoroid head, while stick the other end to the base. 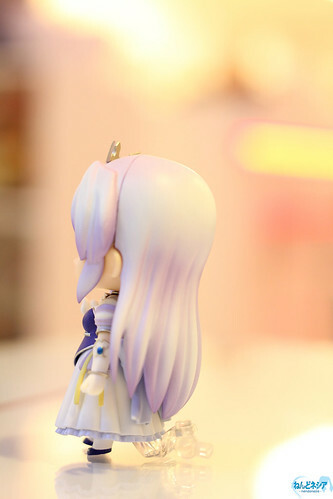 Skirt / legs holder: We usually find this type of stand on older Nendoroid. There are many variations of this stand type, depending on the Nendoroid’s outfit. 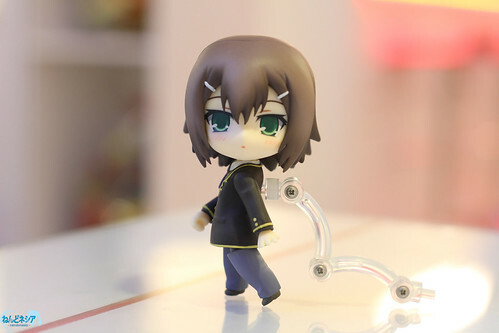 Actually, there are other type of Nendoroid as well, such as pincher stand and one-leg holder, but they are rarely used. The next step would be as simple as adjusting the position of the stand arm (if applicable) and put the end of the stand-arm to the floor or wherever you find comfortable for your Nendoroid to stand on. 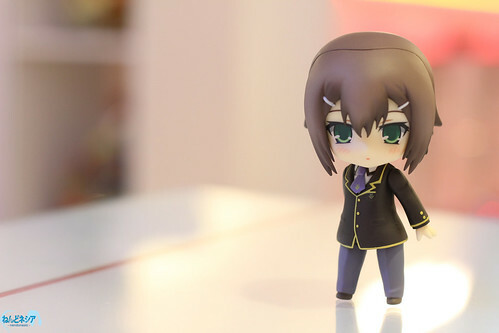 The catch is that not all Nendoroid stands are able to do this trick. 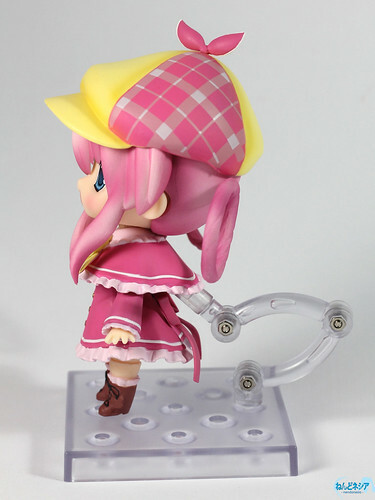 The pincher stand arm (Nendoroid Kagamine Rin) and docking stand (Nendoroid Melissa Seraphy) are some examples of such stand type. The most obvious idea is using your Nendoroid twin-tails as an additional support to make him/her stand. Nendoroid Hatsune Miku (as well as her derivatives), Nendoroid Kokonoe Rin, and Nendoroid Gumako are famous for this feature. Some Nendoroid have stable body and slightly bigger footwear that allow them to stand on their own feet. Nendoroid Kagamine Rin and Len, as well as a few others are known to have this feature. Keep in mind about “3-points rule”, which more or less states that a thing will be able to stand properly (as in “stable”) if it is supported in at least 3 points, that are split in certain distance to allow the pressure to be divided evenly to each point. 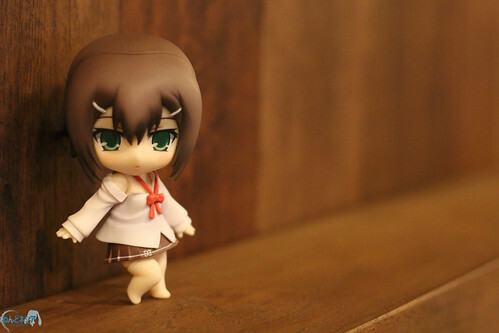 If we apply it to the Nendoroid, then his/her legs are counted as two supportive points (unless the legs was attached within each other), and the stand arm will be the third one, so that the Nendoroid could stand properly – this is a simple example though, so you have to experiment with it by yourself. This entry was posted in Tips and tagged nendoroid, stand base. I have a Megurine Luka NENDOROID who came with a square stand base, but not the circle stand base as I’ve seen in almost all reviews. ((It says MADE IN CHINA and has copyright imprinted on it)) Do only some NENDOROIDS get this? It’s no big deal, I’m just curious. As you can see, there is no back or hair plug. How do I fix the back holder? Where am I supposed to plug it? Please help. Firstly, I want to let you know that I have not unboxed my Asuna yet. So … looking at the length of the stand holder, it looks like there should be a peg on her back/hip/skirt or somewhere around it. Have you checked every area of her body? Her back and hair seem pretty smooth, no hole whatsoever. You can just let her rely on this stand with her hair, but its not steady, there is no fixation. The hole should be there, but its absent! Pardon me, I found it. Just needed to remove thу torso. The hole is very small and cannot be seen from below the hair. Anyway, thank you for this article and good luck! 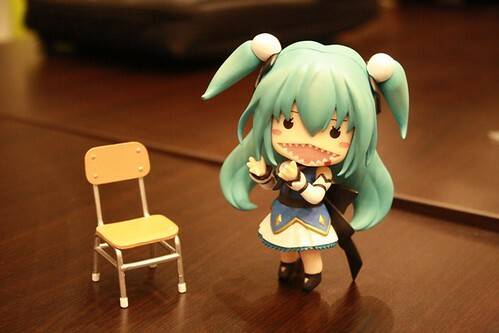 So I just got my Miku Nendroid today, and she comes with a pincher stand. It’s really hard to set her on it. Besides twin tails, are there other ways to use her pincher stand?!?!?! 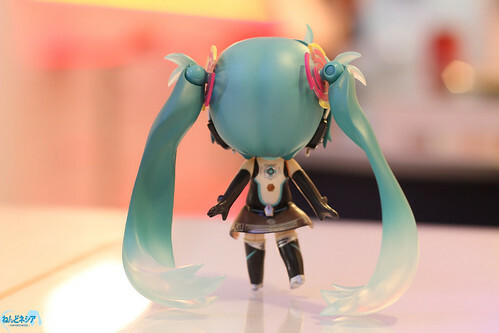 Which version of Nendoroid Hatsune Miku do you have? If it possible, you can try attaching a pic of your stand and Nendoroid here, so that we can help further.